Reading residents, students and staff can continue to enjoy one of the UK's best parks and green spaces after the University was awarded a sixth consecutive Green Flag award today. The Whiteknights campus includes a lake, woodlands and the widely enjoyed Harris Garden set among 123 hectares. It has consistently received the highest scores among 1,686 parks and green spaces receiving a Green Flag. 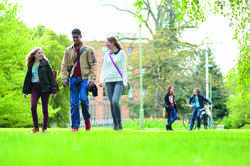 "We're thrilled that the Whiteknights campus has been awarded a Green Flag. "Recent student satisfaction surveys have highlighted the fact that the ‘attractive campus environment' is a key factor in undergraduates choosing to study at Reading, so it is increasingly important that our team of staff and volunteers deliver this. "Maintaining more than 123 beautiful hectares so consistently is something to be proud of, and I pay tribute to all of my staff and volunteers for their hard work." "We are delighted to be celebrating another record-breaking year for the Green Flag Award scheme, especially as we celebrate the 20th anniversary of the awards. Now in its 20th year, the Green Flag awards scheme is run by the environmental charity Keep Britain Tidy. Any green space that is accessible to the public is eligible to enter for a Green Flag award. For more information on the Green Flag award scheme, visit www.greenflagaward.org.